Strengths and weaknesses are internal to your company—things that you have some control over and can change. Examples include who is on your team, your patents and intellectual property, and your location. 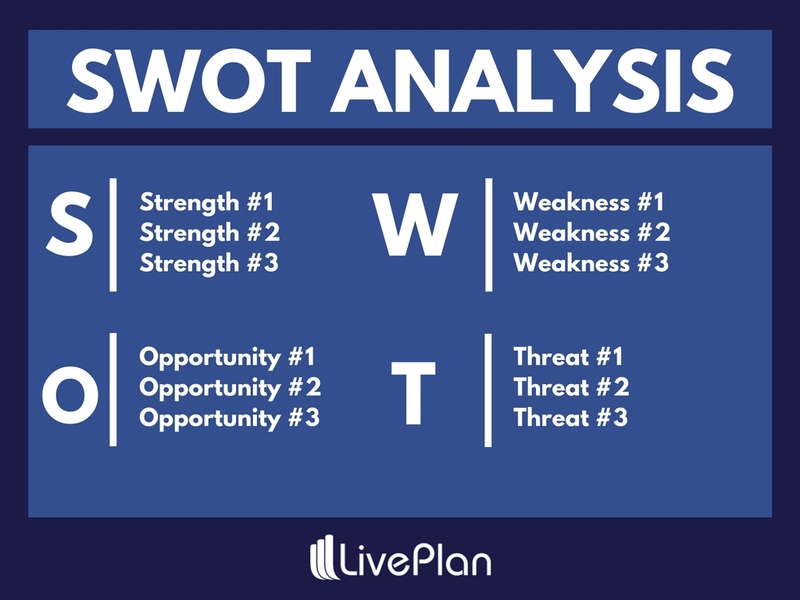 A SWOT analysis organizes your top strengths, weaknesses, opportunities, and threats into an organized list and is usually presented in a simple two-by-two grid. Go ahead and download our free template if you just want to dive right in and get started. Here’s what the layout of a SWOT analysis looks like. For a SWOT analysis to be effective, company founders and leaders need to be deeply involved. This isn’t a task that can be delegated to others. But, company leadership shouldn’t do the work on their own, either. For best results, you’ll want to gather a group of people who have different perspectives on the company. Select people who can represent different aspects of your company, from sales and customer service to marketing and product development. Everyone should have a seat at the table. Innovative companies even look outside their own internal ranks when they perform a SWOT analysis and get input from customers to add their unique voice to the mix. If you’re starting or running a business on your own, you can still do a SWOT analysis. Recruit additional points of view from friends who know a little about your business, your accountant, or even vendors and suppliers. The key is to have different points of view. Existing businesses can use a SWOT analysis to assess their current situation and determine a strategy to move forward. But, remember that things are constantly changing and you’ll want to reassess your strategy, starting with a new SWOT analysis every six to 12 months. For startups, a SWOT analysis is part of the business planning process. It’ll help codify a strategy so that you start off on the right foot and know the direction that you plan on going. As I mentioned above, you want to gather a team of people together to work on a SWOT analysis. You don’t need an all-day retreat to get it done, though. One or two hours should be more than plenty. Gather people from different parts of your company and make sure that you have representatives from every part. You’ll find that different groups within your company will have entirely different perspectives that will be critical to making your SWOT analysis successful. Doing a SWOT analysis is similar to brainstorming meetings, and there are right and wrong ways to run them. I suggest giving everyone a pad of sticky-notes and have everyone quietly generate ideas on their own to start things off. This prevents groupthink and ensures that all voices are heard. After five to 10 minutes of private brainstorming, put all the sticky-notes up on the wall and group similar ideas together. Allow anyone to add additional notes at this point if someone else’s idea sparks a new thought. Once all of the ideas are organized, it’s time to rank the ideas. I like using a voting system where everyone gets five or ten “votes” that they can distribute in any way they like. Sticky dots in different colors are useful for this portion of the exercise. Based on the voting exercise, you should have a prioritized list of ideas. Of course, the list is now up for discussion and debate, and someone in the room should be able to make the final call on the priority. This is usually the CEO, but it could be delegated to someone else in charge of business strategy. 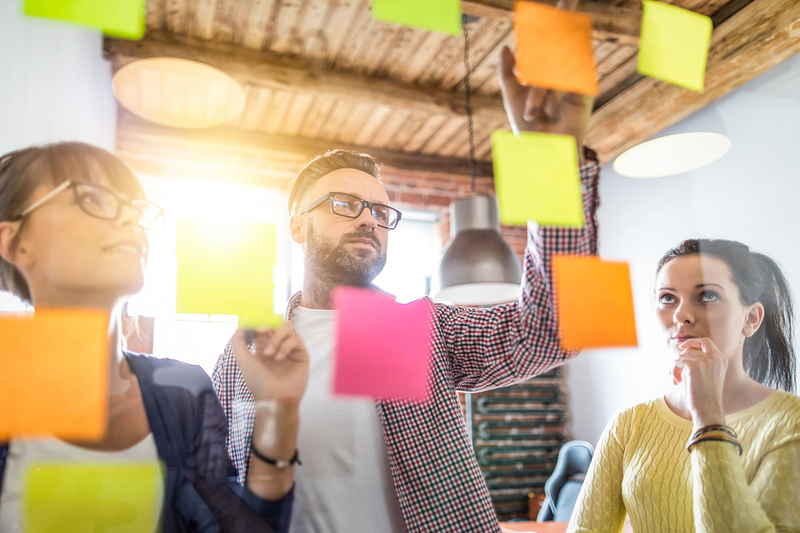 You’ll want to follow this process of generating ideas for each of the four quadrants of your SWOT analysis: Strengths, Weaknesses, Opportunities, and Threats. Here are a few questions that you can ask your team when you’re building your SWOT analysis. These questions can help explain each section and spark creative thinking. Strengths are internal, positive attributes of your company. These are things that are within your control. What business processes are successful? What physical assets do you have, such as customers, equipment, technology, cash, and patents? Weaknesses are negative factors that detract from your strengths. These are things that you might need to improve on to be competitive. Are there things that your business needs to be competitive? What business processes need improvement? Are there tangible assets that your company needs, such as money or equipment? Is your location ideal for your success? Opportunities are external factors in your business environment that are likely to contribute to your success. Is your market growing and are there trends that will encourage people to buy more of what you are selling? Are there upcoming events that your company may be able to take advantage of to grow the business? Are there upcoming changes to regulations that might impact your company positively? If your business is up and running, do customers think highly of you? Threats are external factors that you have no control over. You may want to consider putting in place contingency plans for dealing them if they occur. Do you have potential competitors who may enter your market? Will suppliers always be able to supply the raw materials you need at the prices you need? Could future developments in technology change how you do business? Is consumer behavior changing in a way that could negatively impact your business? Are there market trends that could become a threat? 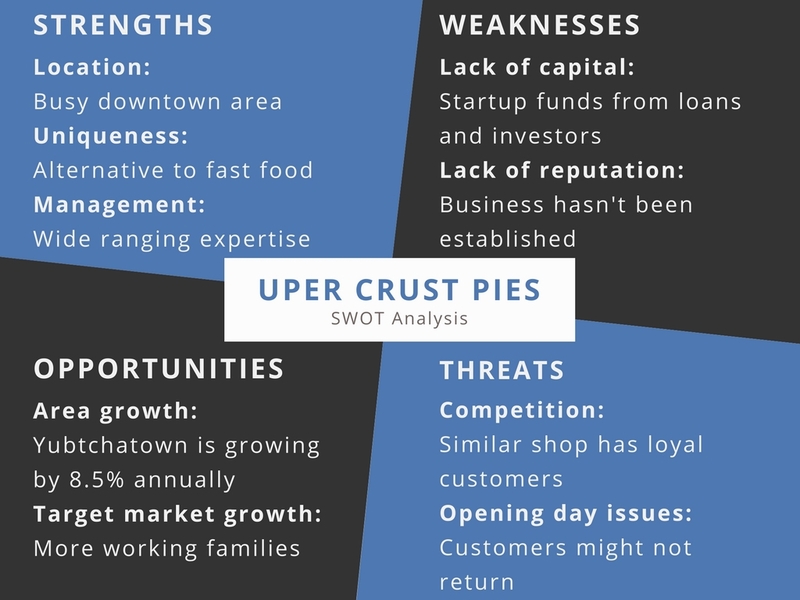 To help you get a better sense of what at SWOT example actually looks like, we’re going to look at UPer Crust Pies, a specialty meat and fruit pie cafe in Michigan’s Upper Peninsula. They sell hot, ready-to-go pies and frozen take-home options, as well as an assortment of fresh salads and beverages. The first step is to look at your strengths and figure out how you can use those strengths to take advantage of your opportunities. Then, look at how your strengths can combat the threats that are in the market. Use this analysis to produce a list of actions that you can take. With your action list in hand, look at your company calendar and start placing goals (or milestones) on it. What do you want to accomplish in each calendar quarter (or month) moving forward? You’ll also want to do this by analyzing how external opportunities might help you combat your own, internal weaknesses. Can you also minimize those weaknesses so you can avoid the threats that you identified? Again, you’ll have an action list that you’ll want to prioritize and schedule. Back to the Uper Crust Pies example: Based on their SWOT analysis, here are a few potential strategies for growth to help you think through how to translate your SWOT into actionable goals. Investigate investors. UPer Crust Pies might investigate its options for obtaining capital. Create a marketing plan. Because UPer Crust Pies wants to execute a specific marketing strategy—targeting working families by emphasizing that their dinner option is both healthy and convenient—the company should develop a marketing plan. Plan a grand opening. A key piece of that marketing plan will be the store’s grand opening, and the promotional strategies necessary to get UPer Crust Pies’ target market in the door. With your goals and actions in hand, you’ll be a long way toward completing a strategic plan for your business. I like to use the Lean Planning methodology for strategic plans as well as regular business planning (learn more about it here). The actions that you generate from your SWOT analysis will fit right into milestones portion of your Lean Plan and will give you a concrete foundation that you can grow your business from. You can download our free Lean Plan template to help you get started. If you have additional ideas for how a SWOT analysis can help your business and how it fits into your regular business planning, I’d love to hear from you. You can find me on Twitter @noahparsons.